Hi loves! Today I have a picture heavy post to share with you, as I got to review the Colors by Llarowe Winter 2015 collection ^^. It's a 12 piece set full of gorgeous holographic and shimmery shades, which are set to release November 23th as a pre-order. Colors by Llarowe 'shroom With A View is a mushroom taupe brown scattered glow holo with lighter taupe flame. First of all, I absolutely LOVE the name. I think it's just so clever and cute! Also, the color is drop dead gorgeous. Muky, dark, unique, but still quite wearable, it's a headturner! I used 2 coats and topcoat for this swatch. The first layer was ever so slightly patchy but it ended up opaque in 2 coats. Colors by Llarowe Berries in the Snow is a blackened berry wine intense linear holo. Helloooooo nurse! Vampy shades like these always make my heart skip a beat and combined with the lovely pigmented formula, this one is just dreamy ♥. I used 2 coats and topcoat. Colors by Llarowe Breathless is a deep magenta red crelly with red to gold shimmer. Does it live up to the name or what?! So deep and dark and shimmery, and that shimmer that sparkles red and gold. Perfect for the holidays! It did go on a bit patchy, shades like these can play tricks on you an have lighter patches in the wrong lighting, so I used 3 coats and topcoat. Colors by Llarowe Fairy Dust is a white jelly scattered holo with multi sized holo shimmer and micro glitter. This reminds me a bit of a Lacquester shade I reviewed in the past, it has the same translucent and colorless appearance. Fairy Dust can both be layered and build up to opacity, which is what I did using 3 coats and topcoat. It applies evenly and easily. Colors by Llarowe Hot Buttered Rum is a beige scattered glow holo with golden yellow flame. I can't even with such a gorgeous neutral shade, the holo flame keeps it from being boring and the color makes it perfectly appropriate for the office :-). Formula is great too, 2 easy coats and topcoat were all I needed. Colors by Llarowe Ice Ice Baby is a medium sky blue intense linear holo with blue and turquoise flame. Wowza, isn't this a gorgeous and intense blue? It did start out a bit sheer so I used 3 coats for full impact, but they went on easily. Topped with topcoat. Colors by Llarowe If You Dare is a deep hot pink fuchsia intense linear holo with intense violet flame. I'm not the biggest fan of pink, well I do love the look of pink shades but somehow never wear them, but this beauty.. a true headturner! Lovely buttery formula, 2 easy coats and topcoat were all I needed. Colors by Llarowe Jewel of Denial is an emerald green with slight blue undertone linear holo with aqua flame. Such a beauty! And also one of the shades I already wore out, I just have a thing for greens and teal shades lol. It did stain my nails, though it seems my nails are quite sensitive to staining. I used 2 coats and topcoat. Colors by Llarowe Peacock Parade is a deep blue toned teal soft linear holo. Even though this might look close to Jewel of Denial, you'll need both :-P. It's just so dark and brooding and gorgeous! Again, a smooth formula that only required 2 coats and topcoat. 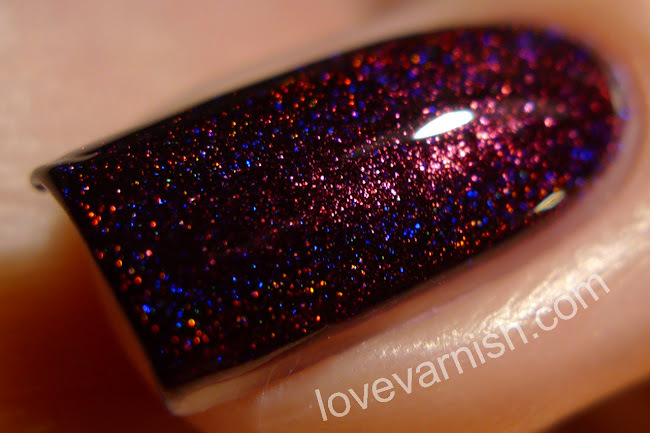 Colors by Llarowe Plum Perfect is a medium plum fuchsia intense linear holo with blue flame. Are you kidding me?! How perfect is this purple shade? I absolutely love it because it's a bit lighter than your usual purple holo, and the flame is so strong <3. 2 coats and topcoat for this swatch. 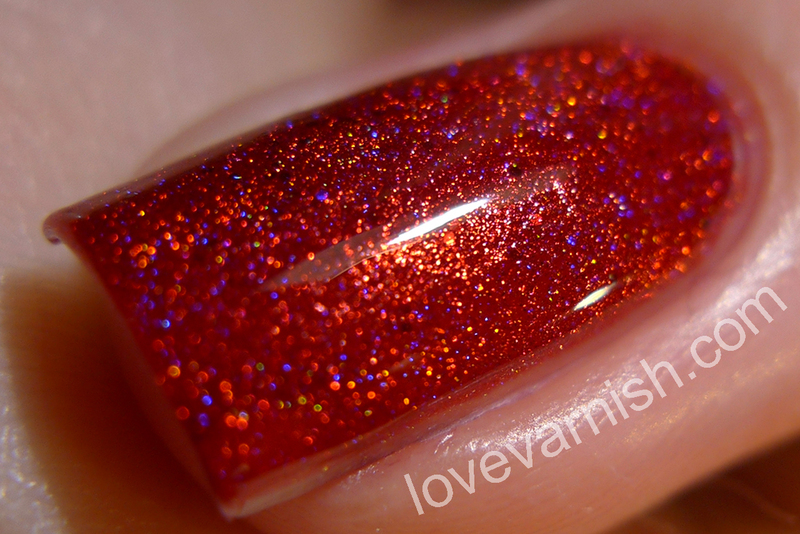 Colors by Llarowe Santa Baby is a medium neutral red intense linear holo with red flame and red sparkle. What's a Winter collection without a proper red? This one fits well and the extra sparkle is a nice touch. I used 2 coats and topcoat here. Colors by Llarowe Tree of Lights is a Christmas green scattered holo with multi sized holo microglitter. Another mandatory shade in a Winter collection, a true Christmas green! The holo microglitter is so good, it adds a lot of depth and sparkle. Again, 2 coats and topcoat. Like always, Colors by Llarowe delivers a gorgeous set of polishes. There are quite a few unique shades included and the variety is great, though most polishes share the same finish (which I definitely don't mind). The formula was good for all of them, most are good in 2 coats and some needed a third coat, but nothing too troublesome. My favorites are 'shroom With A View because it's so unique, Hot Buttered Rum because it'll be perfect for various occasions and Berries in the Snow because vampy ♥, but basically you'll need all of these and I ain't sorry for that! Do you see any shades that call your name? Which one would you pick if you could only have one? Tell me in the comments!